Waking up with a headache, sore jaw, or neck pain can cause just about anyone to start off the day on the wrong foot. However, starting the day off this way morning after morning can indicate that a sneaky culprit is involved. Bruxism is the involuntary grinding of the teeth at night due to the clenching of the jaw. Sleep bruxism is typically considered to be the most harmful type of bruxism because of a person not being aware that s/he is actually clenching the jaw or grinding his or her teeth. They type of behavior is referred to by dentists as a Para functional habit – meaning that a certain part of the body (in this case, the jaw) is being used in a manner different from what is considered its normal function. At Gold Hill Dentistry, we offer patients solutions to breaking the habit of sleep bruxism. Patients who continually wake with discomfort in the jaw should seek help from a dental professional. There are often telltale signs of damage left on the teeth that make bruxism easy to diagnose. There is also an incredibly reliable way to diagnose sleep bruxism when signs on the teeth are not easily spotted with the use of electromyography measurements. This is a test that picks up on the amount of facial movements made while a person is sleeping. The most common form of treatment for sleep bruxism is the use of dental guards or splints worn at night to protect the teeth and muscles of the mouth from grinding that takes place. For those with bruxism that is caused by improper alignment of the teeth, Invisalign aligners can gradually align the teeth and prevent bruxism. 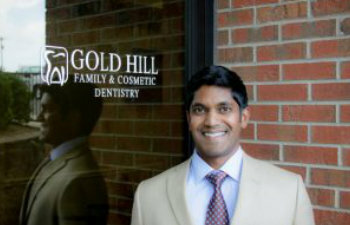 At Gold Hill Dentistry, we are here as a comprehensive dental practice to ensure that our patients achieve optimal oral health. If you are suffering from the effects of sleep bruxism contact our office today to schedule an appointment to start your journey to a better night’s rest and a good morning.